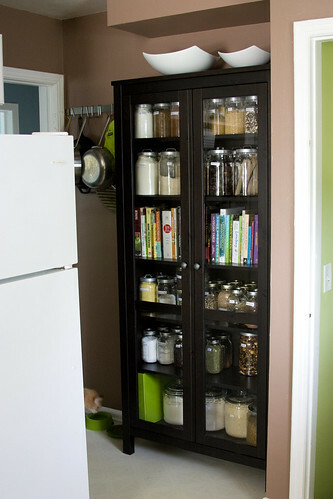 I will someday get a real pantry in my kitchen, but for now I would consider doing something like this. Just not sure where the cabinet would go. Reisenthel has the most modern styled bags and organizers. I'm dreamingup a wish list now. I've been trying to find the best products and recipes to clean our house with non-toxic products. It gets expensive trying all the products out there like Method and Seventhe Generation. So finding this site was really handy. I've opted to start using products like baking soda, vinegar, castille soap, and water. I'm using swiffer sheets to dust our furniture as well as pick up dust on the floor. And I have Murphy's Oil which is vegetable oil based to clean the hardwood floors. I can't wait to try vinegar on the linoleum. If that doesn't work I'll try the baking soda route. Great article in NY Times about a couple who renovated their 300sq ft apartment to keep cheap rent when they were expecting their first baby. And Now a Baby, Too! ApartmentTherapy has more info as well. I hope I can be as clever in redesigning the use of space in our house. I really can't complain. Perhaps a redesign of the kitchen should be in order soon. I'm aching to rip out never clean vinyl floor. I can't stand having white floors! It's time to give up the Ikea daybed I got last summer. It really doesn't suit the style we like but it definitely comes in handy when people stay overnight. I was purusing Dwell magazine recently and came across some amazing samples of the updated "futon" couch motif. Mobelform: cabrio-in (under products/sofabeds) They have an amazing assortment under the sofabeds and wallbeds. The cabrio-in is a bed and desk in one. The desk rises when the bed is unfolded. This would be ideal in a dorm or small office/guest room. So as you can tell we're trying to make the office more inviting and relaxing when doing writing or emailing but also be useful when we have a guest. If we end up moving to a large metro city it would be great to have this type of furniture for economizing on space. Design within Reach also a few that were quite interesting. I remember someone asking me when they visited recently where I had got my brown leather cubes in the living room. I actually got them from Craigslist over the summer. I got them 2 for $80 after negotiating it down from $120. Well I was perusing Ballard Designs catalog I got in the mail the other day and found the same exact ones on there. Leather Cube $239 each or 2 or more 229 each. They are alot more than I thought but it would have been nice to get the red ones. Amazing rugs at Angela Adams. Will be placing my order shortly of a few. Can't wait to walk on them. I can't believe we've painted our dramatic new living room in new bright bold colors. I'm wondering if we should do the hallway in green and blue just so that we have some fun crayola colors. It's quite exciting. The colors are all from our Peter Max serigraph so I can't wait to put the painting up to see how it brings everything together. So I finished the office painting today. It turned out really nice! I was totally not sure while I was painting the stripes, but of course I trusted the designer, Re:Modern. How could I break my own values from my IA days of watching implementation of my wireframes into websites...no way. If I could do it I would, but I can't so I hire someone who can. Next project, living room and kitchen. Bedroom furniture comes in next week. I'm getting pretty excited. We just finished painting the master bedroom. I had a bad cold last week so I couldn't finish it as fast as I wish I could have. Luckily Jeff would help after dinner with some of the trim which actually took the longest time. Photos of the bedroom transformations. Removed carpet, refinished existing hardwood floors, painted ceiling, walls, trim and closets, will put in repainted baseboards tonight. NY Times article on suburbs vs. city from the perspective of several couples who have done the move or doing the move. Ever since coming back from HK we have had to face some of the same issues these couples/families have had to face. We really miss the convenience and closeness of life un HK. While we have a bigger home and nice yard here, it's still quite lonely to be home alone all day and having to drive everywhere to run errands is quite challenging. So right now I'm trying to cope and find things to do and explore new ways of looking at our neighborhood. I wonder if this longing will change once we have kids? Jeff and I pulled out the carpet and discovered some huge water damage. The Stuart Floors guy mentioned that with sanding they can remove the parts that were messed up. He was right. Photos of the floor work. We're redoing the floors in our bedroom. When we first checked out this house a few years ago we were wondering why there was pink carpet. We just couldn't figure out why a single very masculine guy would pick pink carpet. Well today when pulling out the carpet and base board we found pink walls. So maybe he never picked them and it always has been pink. But boy the pink on the walls reminds me of Pepto Bismol. Argh! So the floors will be refinished and hopefully Jeff's allergies will go away. Today is the first day of remodeling for the house. I'll be documenting our efforts shortly. Some of it will be in DIY style but hopefully it will be fun as well. I just couldn't pass this one up. A NYPL librarian reveals the secrets of organizing her own private library. I used to have open bookcases of all my books collected since middle school but after moving from place to place(including the Midwest) I have reduced it to several boxes. Even before we packed everything up before we left my books were in a makeshift closet bookcase. In feng shui, having open book cases represent not resolving the past. Also with the mix of paperbacks falling apart with nice signed IA books I just had to start weeding( of course I kept the signed ones). Just the same the article is kind of interesting and I know my bibliophile friends out there would appreciate it. Been working in the garden over the past 2 months, ever since I was able to start walking. I've chronicled most of my garden adventures through pictures. We also recently purchased patio furniture that is much more comfortable than the Safeway plastic chairs, so we'll hoping to start entertaining in the next few weeks.